(3813, Czarina Conlan Collection, OHS). A World War I hero, Joseph Oklahombi (Choctaw for man-killer or people-killer) was born May 1, 1895, in the Kiamichi Mountains of McCurtain County, Oklahoma. A full-blood Choctaw from Bismark (present Wright City), Choctaw Nation, Indian Territory, he served in the Thirty-sixth Infantry Division's Company D, First Battalion, 141st Regiment, Seventy-first Brigade during World War I. During the October 1918 Meuse-Argonne campaign German intelligence successfully intercepted Allied military correspondence. To combat the problem the 141st, 142d, and 143d Infantry Regiments utilized Choctaw soldiers, including Oklahombi, to translate messages in their native tongue. At headquarters they "decoded" Choctaw into English and communicated messages to those in the field. 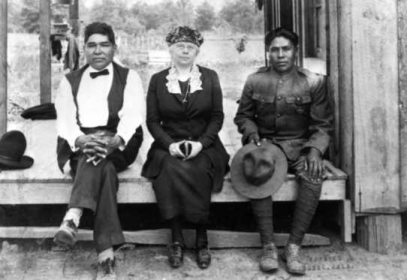 These Choctaw were the original "Code Talkers." At St. Etienne, France, on October 8, 1918, Oklahombi assisted his unit as other than a translator. He and twenty-three fellow soldiers attacked an enemy position and captured 171 prisoners. They seized the artillery at the site and purportedly killed seventy-nine German soldiers, tended the wounded in "No Man's Land," and held their position for four days while under merciless attack. Misinformation led many to believe that Oklahombi acted alone at St. Etienne, and he was identified as "Oklahoma's Greatest Hero." For his bravery he was awarded the Silver Star with the Victory Ribbon from the United States, and from Marshal Henri-Philippe Petain he received the Croix de Guerre, one of France's highest honors for gallantry. Despite the heroism of Oklahombi and his regimental mates, Congress did not issue them the Medal of Honor for their valor. After the war Oklahombi returned to Wright City to be reunited with his wife and son. Despite being offered a Hollywood role in a war movie, he refused to leave Oklahoma. He was struck and killed by a truck as he walked along a road on April 13, 1960, and was buried with military honors in the Yashau Cemetery northwest of Broken Bow. Bishinik (Durant, Oklahoma), 10 November 1997. Thomas A. Britten, American Indians in World War I: At Home and at War (Albuquerque: University of New Mexico Press, 1997). Louis Coleman, "Oklahoma's 'Greatest' Hero? A Review of the Military Record of Joseph Oklahombi," The Chronicles of Oklahoma 80 (Summer 2002). Corie Delashaw, "Oklahombi, Joseph," The Encyclopedia of Oklahoma History and Culture, https://www.okhistory.org/publications/enc/entry.php?entry=OK091.